The word seva means “selfless action that serves community.” This path of yoga is committed to surrendering our actions to a higher purpose. The Purusha Seva Project is committed to the journey of acquiring a deeper understanding of the health and healing benefits of classic Hatha/Raja yoga philosophy and practices. The Purusha Seva Project believes that Yoga, Meditation, and Yoga Therapy can provide a complementary and cost-effective method of alternative and preventive healthcare. By developing innovative and cost saving programs that serve the people of our communities, and delivering such programs in an accessible and complimentary manner to existing services, the Purusha Seva Project seeks to create communities of healthy, flourishing people. The Mission of the Purusha Yoga Therapy For Vets Program is to deliver the larger mission stated above of the Purusha Seva Project and also more specifically to provide to Veterans of all ages, stages, and reasonable health an opportunity to practice yoga at a community studio with other Veterans in a closed class that is structured to meet their needs and treat the specific symptoms of PTSD, chronic pain, Traumatic Brain Injury, Mood Disorders and other common diseases of the modern world such as diabetes, obesity and heart disease. Each Vet that graduates from the 8 week program is eligible to become a regular member of the Yoga Studio at a discounted price. Find your inner vitality and self confidence with a class designed to meet your needs and desires for optimal health. This class will improve strength, flexibility, balance, and mobility. Specific practices to reduce hypertension, stress, anxiety and depression- creating peace of mind, vitality and a relaxed state. Common concerns are addressed such as arthritis, bone health, posture and circulation. 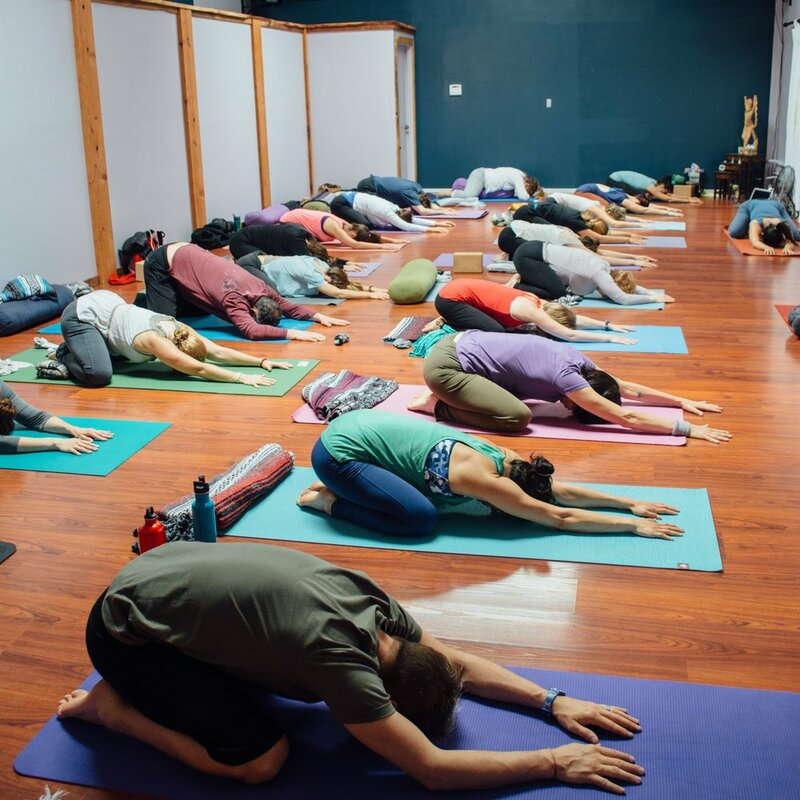 The class is taught by an advanced Yoga Teacher/ Yoga Therapist with experience and expertise in accommodating for a wide variety of individual needs. Feel welcome and safe in a warm and friendly environment that is consistent and professional. Chair and wall support are provided as well as other yoga props. Appropriate for reasonably healthy adults with average mobility. LOCATION: Class is in the Grove/ Picnic area between Queen Wilhemina's Gardens/Windmill and 47th avenue. Take yourself outside and into the beauty of this city's heart and soul. Practice yoga under the trees and let the ocean air sooth and invigorate you. This class expertly blends breathing and movement, strength and grace, imagination and form. You will gain a personal understanding of the 8 limbs of yoga and your true self (purusha) by practicing in nature and community. Donations benefit the Purusha Seva Project. The Purusha Seva Project is a 501-C3 non profit organization that brings the Purusha Method of Yoga to under served and at risk populations such as Veterans. Join Amina Soubra from Purusha Seva Project for Community Yoga classes with specialized emphasis on detoxification, healthy body alignment, holistic energy needs and building core strength. Amina Soubra is a certified yoga teacher and holistic nurse. She is an advocate for healthy body image, health and wellness, and teaches yoga as a way to promote courage, confidence, and organic self care. An all-levels class led by master yoga teachers, inspired to bring mind/body wellness and community surrounding serene views of Lake Merritt. Expert teacher Yazmine Amina will guide your child through basic yoga moves while they think they are playing! Your child will learn cat and cow poses, meowing and mooing the whole way through, and learn how to stretch and bend like a real yogi. Our kids' yoga class is a great way for little ones to release energy and give you a moment to relax! For kids ages 2+ and their parents/caregivers. Yazmine Amina is a certified yoga teacher and holistic nurse. She is an advocate for a healthy body image, holistic health and wellness, and she teaches yoga as a way to promote courage, confidence, and organic self care.